ReverseIt creates backwards videos. We have designed ReverseIt Media Software to be easy to use and learn. Use ReverseIt to add more punch to YouTube video projects. We know there are other ways to reverse a video clip, But we wanted a simplier, more reliable way. For just $5 this is a much better solution. Reverse WMV and AVI files. Reverse or exclude the audio. Save as WMV8 or WMV9 with custom Profiles. Build custom WMV Profiles. 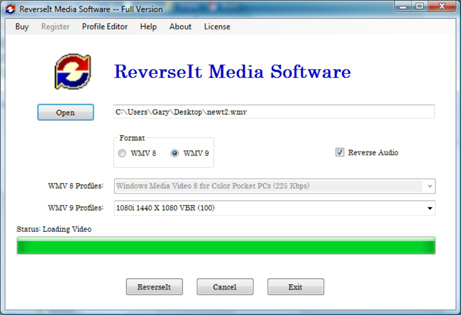 ReverseIt allows you to reverse the direction of video. Backwards movie. ...... For just $5 this is a much better solution. * Reverse WMV and AVI files. * Reverse or exclude the audio. * Save as WMV8 or WMV9 with custom Profiles. * Build custom WMV Profiles. * Easy video based help. Convert all your Video and Audio Medias, made simple for all, direct access. Qweas is providing links to ReverseIt Media Software 3.0 as a courtesy, and makes no representations regarding ReverseIt Media Software or any other applications or any information related thereto. Any questions, complaints or claims regarding this application ReverseIt Media Software 3.0 must be directed to the appropriate software vendor. You may click the publisher link of ReverseIt Media Software on the top of this page to get more details about the vendor.